​L-Citrulline vs. L-Citrulline DL-Malate: Which Is Best? L-Citrulline vs. L-Citrulline DL-Malate: Which Version is Best? L-citrulline is one of three dietary amino acids involved in the urea cycle, which also includes L-ornithine and L-arginine. When it enters the body, citrulline is turned into arginine in the kidneys, making it a potentially beneficial supplement for increasing your arginine levels. L-citrulline is present in a variety of foods, especially watermelons. Watermelons have the highest natural concentration of L-citrulline, present in both the fruit’s meat and the rind. Citrulline can also be found in certain legumes, including garbanzoe beans, peanuts, and soy. In terms of meat, it’s found high concentrations in liver and in smaller amounts in red meat and salmon. With such varying food choices and concentrations, many turn to supplementation to increase the amount of citrulline they take in. While some use varying forms of L-citrulline, others turn to L-citrulline DL-malate. Let’s take a closer look at these two compounds and determine which of the two might work better for your needs. As mentioned, citrulline is an important precursor to arginine. Arginine is then converted into nitric oxide and more citrulline by nitric oxide synthase. Why not just take arginine supplements to increase arginine levels? The answer is arginase, an enzyme found in the stomach and intestines. Arginase breaks down arginine directly into ornithine and urea, neither of which are involved in the formation of nitric oxide. Arginine supplements get broken down in your stomach and intestines before they can get absorbed and reach your blood. Taking an arginine supplement may lead to a sudden spike in arginine but that quickly tapers off. High amounts of arginine have been found to potentially cause digestive problems as well. Citrulline and citrulline malate supplements increase arginine levels in your plasma over a longer period of time. On its own, citrulline also plays a role in the urea cycle. This cycle, which occurs in the liver and kidneys, is primarily involved with removing ammonia from your blood in the form of urea. Citrulline and its potential effects on arginine levels may support cardiovascular health and overall circulation. Studies suggest L-Citrulline may promote healthy blood pressure by causing blood vessels to dilate. This increased circulation may extend to systems and organs throughout the body. Research also shows that citrulline may increase nitric oxide levels. Nitric oxide is a molecular compound that is primarily involved in helping cells transmit signals, allowing for intercellular communication. Nitric oxide also plays a role in circulation, further contributing to citrulline’s other potential effects on blood flow. Studies also show nitric oxide has a role in regulating activities in essentially all your organs. Nitric oxide may help to promote cardiovascular health and support your immune system. Nitric oxide is most popular among athletes for its potential muscle-building benefits. The increased blood flow may contribute to quicker muscle recovery and growth while delivering more nutrients to muscle tissue. A preliminary study on cyclists suggests that nitric oxide may improve endurance and promote longer, harder workouts by combating lactic acid buildup, the main cause of muscle fatigue during intense training exercises. The potential increased circulation from citrulline and nitric oxide may also contribute to improved neural functions. Research indicates that greater circulation to the brain means more blood and nutrients to vital neural tissue, which may encourage the growth of nerve cells. This may result in improved memory, both short- and long-term, and memory recall. Studies suggest L-Citrulline may support natural metabolic rates, supporting weight loss efforts. It may also contribute to increased strength and leaner, larger muscles. Other studies indicate L-Citrulline may support immune system functions. L-citrulline DL-malate is simply citrulline with an added malic acid component. Malate, or malic acid, is a naturally occurring organic compound found in a variety of fruits, though it is most commonly used as a food additive or preservative. When combined with citrulline, malic acid has been shown to promote better absorption and higher bioavailability. However, some studies also suggest that malic acid may have some potential benefits of its own, including supporting pain management and increased physical energy. It is also often included in skincare products for its potential exfoliating properties. Citrulline DL-malate tends to be the preferred nootropic as it may increase arginine and nitric oxide levels while potentially increasing energy output from the malic acid, offering a one-two punch that may be popular among many bodybuilders and athletes. However, citrulline may be beneficial on its own if you don’t require the potential benefits that may come from malic acid. Choosing between the two compounds ultimately comes down to your own personal needs. Be aware that some dietary supplement vendors will offer citrulline malate with more malic acid than citrulline. This skewed ratio may lead to potentially lower quality effects. It is recommended that you find citrulline malate with a two to one ratio. That means twice the grams of citrulline for every gram of malate. 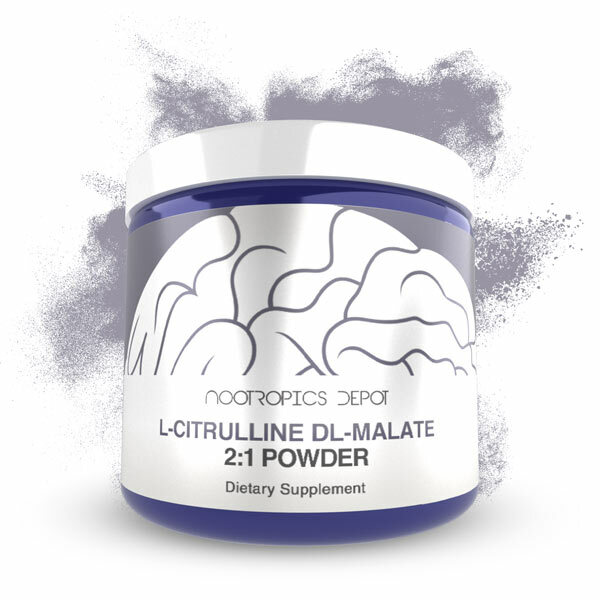 You can find L-citrulline DL-malate 2:1 powder at Nootropics Depot, ensuring a proper ratio in this nootropic supplement.